Not for everyone, but this pedal has a unique, quirky sound. Throaty overdrive tones. Chewy talk box/harmonic leads. Something different. 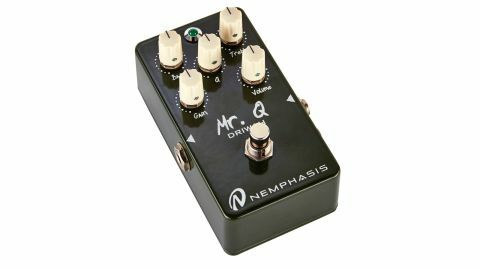 No expression pedal Q control. Driwah? Is this a new pedal genre? While the name suggests a combined overdrive and wah, what we get is an odd hybrid. "Kick in the pedal and you'll get a throaty overdrive that gets more saturated as you turn up the gain"
While the volume knob turns up the output, and bass and treble offer sympathetic tonal shadings, it's the gain knob and the Q knob that control the action. Kick in the pedal and you'll get a throaty overdrive that gets more saturated as you turn up the gain. This is always affected by the position of the Q knob and sounds closest to straight overdrive at that knob's lowest position. The Q knob controls a filter, emphasising higher frequencies as you advance it. We wouldn't describe the results as wah (although emulation of a 'parked' wah is possible), it's more a chewy talkbox sound for leads that easily take off into upper octave harmonics. It's niche, but the Driwah will give your guitar a different voice that some players will undoubtedly like. We would have liked it more if the Q knob could be put under control of an expression pedal.